In April I felt quite humbled as Bishop Christopher decommissioned Liz, then commissioned myself as Lay Director. The Bishops words. ‘Christ is counting on you.’ To my response, ‘And I on Him,’ was a reminder that, when we are called to God’s work, we do nothing in our own strength. I thank Liz for all her hard work as Lay Director, a hard act to follow. It was back in September 2014 when stood on a cliff in Santiago de Compostela that, I said to Liz that I needed the pilgrimage to spend time in prayer with God to see where he was leading me. Liz’s response was, ‘Then I have something else for you to think about,’ You have guessed it, yes it was to consider being the next Lay Director. That was the last thing I expected to hear and was somewhat taken aback. My immediate reaction was there had to be someone else more able and worthy than me. After some discussion I said I would pray about it. I can assure you a lot of prayer took place. What better place to pray about this role than in the home of Cursillo. On the last day of the Pilgrimage when we were in the Cathedral for the Communion Service. They started to swing the Thurible to dispense the incense, which is an awesome sight. Taking eight people there was a lot of power behind the Thurible being swung, as the it swung higher you could see the lighted coals within it. I was reminded what a mighty, powerful God we have and that in his strength we can do whatever he calls us to do. With His strength and your prayers and support I will aim to fulfil this calling. As I started to shadow Liz it became apparent that we may have to change the venue of our Cursillo’s, so that became my focus. After a visit to Bishop Grossetteste with Stuart and Leslely Duff things were put into motion. As you all now know that change has taken place. I am pleased to say that the feedback on the weekend there, has been positive. 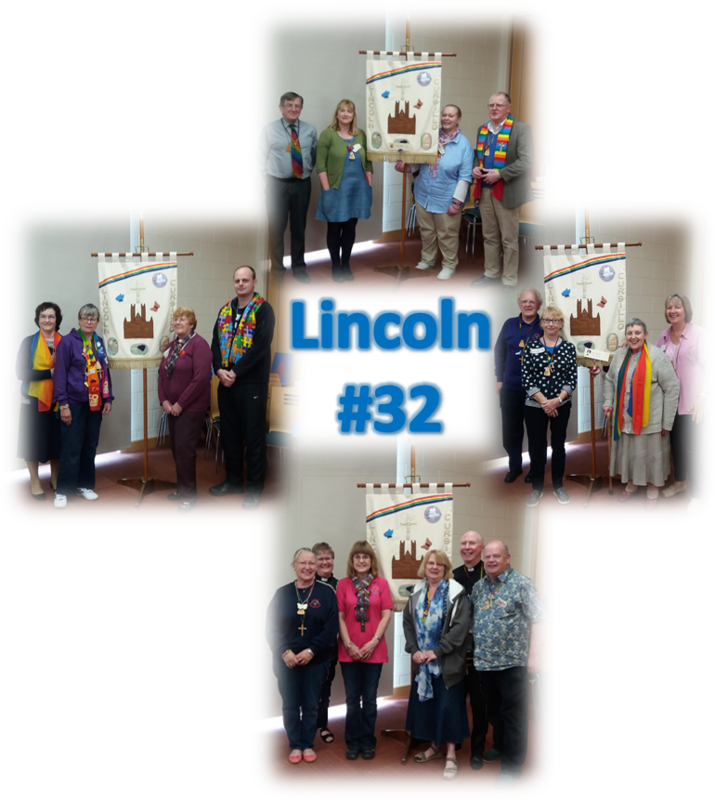 Lincoln #33 will also be taking place there next year from 4th-7th August so please be thinking of and praying for future Pilgrims. This will download a PDF version. which can be printed as a booklet. First Save the document and then open it up using Adobe Reader. Select Print and choose Booklet and print either Back Side Only or Front Side Only before turning the pages over and returning them to the printer feed tray and printing the other side. To download a Word version click Here. and she will make the necessary arrangements. Please don't contact the venue directly. Six Pilgrims made their Cursillo at our new venue, Bishop Grosseteste University in June. Since one of the two Spiritual Advisors had to drop out. The diaries of many priests, including my own, are filled well in advance. I had a wedding to take on the Saturday and a Communion service on the Sunday, which meant I couldn't fill the gap. As we searched for a replacement, the wedding couple phoned me to postpone their big day until August, and another priest became available for the Communion service! Well, I can take a hint, and when it seems to come from God, it is more like an instruction. So, it was a privilege to train with the team of Lincoln #32, as they prepared for the challenge of delivering the weekend at a different venue. The University Campus has the rooms for Pilgrims and staff, the refectory for meals, the Rollo room, and the chapel in separate blocks, which meant adjustments to timing. The team flowed from location to location on the campus, it seemed to go flawlessly, thanks to the team efforts behind the scenes. It was a privilege to meet the Pilgrims and share the Cursillo experience with them. The privileges for me didn't stop there. As Spiritual Director, I lead the Staff Eucharist on the first day, before the Pilgrims arrrive. In this service, I commissioned the staff for the weekend. I also have the privilege of organising the Clausura Eucharist, delivering an address, and commissioning the Lay rector for the next weekend. In this case, it was Jude Scott for Lincoln #33. In between these SD duties at the beginning and at the end of the weekend, it was a privilege to serve as Spiritual Advisor alongside the other twelve team members, and observe their varied skills and hard work. We had the “What Next?” session with the Pilgrims at the Village Hall at Hackthorn in the morning of the 25th June, followed by our Summer Event. Hackthorn Village Hall and St. Michael Church are set in an estate off the road through the village. It was an impressive venue, led admirably by Lincoln and Lawres reunion Group. They had organised a Eucharist at which the Revd. Carol Munn presided, quizzes, games, a treasure hunt, Evensong; and I didn't have to do anything at all! This was another privilege which I enjoyed considerably. Now it is back to parish duties which, while still a privilege, aren't quite so exciting as a Cursillo weekend. Sadly, I came back to a series of funerals, as well as the usual Sunday services. On a happier note, I am looking forward to four weddings and a baptism. Does that sound like the title of a film? No, that was “Four weddings and a funeral! God is at work in our lives although we don't always recognise it. His touch is sometimes delicate, and sometimes he is more direct. Look out for those touches, hints and instructions in your life, these are privileges which we all receive, but sometimes miss in the busy-ness of our everyday routines. When Teresa and I felt called to be part of Lincoln Cursillo #32 we were unsure about what to expect, our sponsor Linda Harwood didn't want to spoil the surprises that we would experience, we both feel, having completed Cursillo #32 that Linda was right not tell us anything. We arrived at Bishop Grosseteste University at 6pm on Friday 17th June, and left about 6pm on Monday the 20th of June having completed our Cursillo. The whole thing was a total joy for us, the staff were wonderful, Gillian and all the Cursillo staff made us so welcome, different hymns, and different ways of singing them, we found ourselves wishing we had heard of Cursillo before, and done this sooner. Gillian and all the Cursillo 32# staff soon made us feel at home. The experience was very moving and spiritual, we laughed a lot and cried a lot and cried with laughter. for the feeling of Christ like love we all share. Two words, renewal and mission have been used to sum up the aim of the Cursillo movement. So, in practice a Holy Spirit ministry of love turned into action. And that is exactly what I experienced from Lincoln #32. I responded to Gillian’s invitation to come on the weekend firstly because she had asked me to come and she had already, graciously attended charismatic events in my diocese, and secondly because I was curious and open to something new and an opportunity to listen to God. I hope Gillian won’t mind me saying this but I had wondered how she and John were ’alive’ Christians. Now I know. What I experienced over the weekend were drip feeds of love. Everyone was there to serve the pilgrims, motivated by love for Cursillo and how it had affected them. The things that were hidden from us, the pollenca, the party and healing service, the wake up and the clausura spoke the loudest of love in action. It made me stop and think. Is my love for Christ translated into sacrificial love? I know it is to a certain extent but I believe it needs to be more intentional so from that point of view I really like the study, prayer, and action cards and hope to use them in my faith journey to keep me on track. I had prayed the week before I came to Cursillo for some joy and fun to come into my life. Well, God answered that prayer. During and following Saturday evening’s celebration I felt colour and joy and love for the people there whether leading or participating. I certainly laughed more than I have done for a long time. I won’t be carrying on with the Cursillo reunions. I believe I am in a church where I am already encouraged to love and serve in the power of the Holy Spirit. I walk in fellowship with a great number of people and will use my experiences of Cursillo to renew my mind and my faith to enable me to continue to bless others however God wants me to. I believe no experience is wasted. Thank you for the experience. I had so much to accomplish, that I didn't have time to pray. Problems just tumbled about me, and heavier came each task. "Why doesn't God help me " I wondered: He answered, "You didn't ask". I wanted to see joy and beauty, but the day toiled on grey and bleak. I wondered why God didn't show me; He said, "but you didn't seek." I tried to come into Gods's presence; I used all my keys at the lock. God gently and lovingly chided, "My child, you didn't knock." I woke up early this morning, and paused before entering the day. I had so much to accomplish, That I had to take time to pray. What a privilege it was to be asked to come, along with Kath Wells, and our Spiritual Director, Rev Jeff Wilson, to support our dear friend Sandra Smith, as she was commissioned as Lay Director of Lincoln Cursillo. The service took place in the much loved St Hugh's Chapel at Edward King House that sits in the shadow of the beautiful cathedral and was conducted by The Right Rev Christopher Lowson, Bishop of Lincoln, who said, 'What a valuable part Cursillo plays in promoting discipleship in the diocese', an endorsement indeed! During the service, the bishop says 'Sandra, will you seek to be faithful in all that you do as Lay Director in the diocese of Lincoln?' to which Sandra replies ' I do ' and I know she will indeed give 110% in Gods strength and with our love and prayers of support. Sandra took over from Liz Lilley, who was decommissioned at the start of the service with the bishop ending by saying 'Liz, as you journey onwards in the life of faith, free to serve God in new ways, know that you do so with our love and thanks'. Liz has served faithfully as Lay Director for the past three years as well as also taking on the rolls of Lay Rector and Safeguarding Officer at different times during her office!! Liz, we thank you and send you all our love as you enjoy a much earned rest. Lincoln Cursillo Facebook is a closed Group for members of Lincoln Cursillo. or a member of the Secretariat and they will pass on the request. I plan to travel to Iona again in 2017 to spend a week staying with the Iona Community at Iona Abbey. The cost of the stay at the Abbey is in the region of £380 which includes accommodation and all meals. The journey will cost about another £120, with an overnight stay in Oban on the way up. If anyone is interested in joining me, or would like more information please let me know. When I know who is interested we can discuss dates, but it will probably be in June or July. I will need to apply for a group booking this September giving 3 possible dates. As the publicity Rep for Cursillo I can promote Cursillo in 'Crosslinks' but am unable to visit individual benefices/deaneries. Can you help? Please can you make sure (with the priest's permission) that your church/benefice has an up to date poster and a few 3 fold leaflets. These can be downloaded from the web page or contact me for a poster. Could you speck about Cursillo at your PCC or Deanery Synod meeting? A short 5 minute talk would perhaps be enough, get someone to help you. 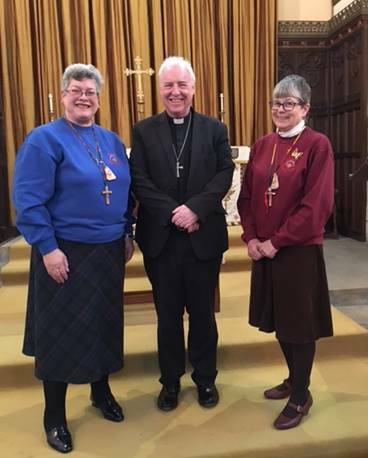 At Clausura #31 Carole Munn asked if Ann and I had attended all 31 Clausuras for we had made our Cursillo in 1990 at Launde Abbey on Southwell #19 and had been very involved in bringing Lincoln #1 to the Diocese in May 1995. Lincoln Cursillo had sprung from a small group of cursillistas at Saint Hugh’s North Hykeham and Saint George’s Crosby, who despite very strong opposition from some within the Diocese had managed to put it together and raise the £2,000 needed to give it birth when the opportunity arose. We felt very honoured and privileged that we were allowed to hold the first Clausura in Lincoln Cathedral but sadly for many reasons the location proved to be unsuitable. It quickly became clear that it was going to be very very difficult to find a venue which met all our requirements. Fortunately, Lesley Sleight our Treasurer, was the wife of the priest at Nettleham and her husband, Gordon, not only offered the full and free use of his church but also made the necessary introductions regarding the use of the Village Hall and later the school when the Hall closed for a period. What a great blessing this has been!! When we put our brains in gear we realised that we could not have attended 31 Claursuras because there has only been 30. The scheduled Weekend after Lincoln #12 was cancelled and in the circumstances surrounding this decision it was decided that the next one should be #14 and not #13. We missed two of the three at Bawtry Hall, so have been to 28 at Lincoln but have also been to ones at Canterbury, Sheffield, Wakefield as well as Southwell, so well over 31 in the end. We have always viewed Cursillo as a stepping stone on your journey of faith on which some may choose to linger for longer periods than others, but it is always there for you. We feel that we are perhaps somewhat on the fringe now but it will always remain our spiritual home and has been a welcome refuge and inspiration during life’s stresses, doubts and anxieties. On our way home after each Clausura, with Thine Be The Glory ringing in our ears, we always feel full of the Holy Spirit and confident that we can face whatever befalls us until we are able to shout Ultreya again. The following Weekends have been sent a Palanca Poster from Lincoln Cursillo. Please support them with Palanca prayer. 7, Saddle Close, Goxhill, N. Lincs. DN19 7GB. Tel. 01469 530896.
all the articles in this Imp Sheet which can be found in the News & Articles page. Items from previous editions can be found in the News & Articles Resource page. If you do not wish to receive the Imp Sheet then please email as above and your name will be removed from the mailing list.